Georgy Apollonovich Gapon[a] (17 February 1870–10 April 1906) was a Russian Orthodox priest and a popular working-class leader before the Russian Revolution of 1905. After he was discovered to be a police informant, Gapon was murdered by members of the Socialist Revolutionary Party. Georgiy Apollonovich Gapon was born 17 February [O.S. 5 February] 1870, in the village of Beliki, Poltava Oblast, Ukraine, then part of the Russian Empire. He was the oldest son of a Cossack father and mother who hailed from the local peasantry. Gapon's father, Apollon Fedorovich Gapon, had some formal education and served as an elected village elder and clerk in Beliki. His mother was illiterate but religiously devout and actively raised her son in the norms and traditions of the Russian Orthodox Church. Gapon was an excellent primary school student and was offered a place at the Lower Ecclesiastical School in Poltava, a seminary that offered Gapon the best prospect for advancing his formal education. In his final year at this school, Gapon was first exposed to the radical philosophical teachings of Lev Tolstoy through one of his instructors, a devoted follower of the Russian writer. This instructor, I. M. Tregubov, regarded Gapon as one of the top students at the school, serious and intelligent in demeanour and diligent and curious in his studies. Following his graduation from the Lower Ecclesiastical School, Gapon was admitted to Poltava Seminary [ru], where he continued to be guided in his study of Tolstoy's ideas by other local followers. Gapon was influenced by the Tolstoyan emphasis on working with the poor and with its philosophical criticism with the formalistic and hierarchical practices of the official church. This brought him into conflict with certain seminary officials, who threatened to rescind his educational stipend. Gapon met this threat by himself rejecting further aid and seeking to pay for his own education through work as a private tutor. Gapon fell ill from typhus, which incapacitated him for a time, making it impossible to earn a living as a tutor and continue his studies effectively. He decided to abandon plans for career as a priest, seeking instead to attend Tomsk University to become a physician, so as to be of greater service to the ailing poor. His plans were short-circuited, however, when the seminary issued him a less-than-perfect grade for behaviour, thereby effectively barring his path to further university education. At the age of 23 Gapon took a job in Poltava as a zemstvo statistician, supplementing his income with money earned working as a private tutor. It was in this capacity that he met the daughter of a local merchant in a house in which he was giving private lessons. The family objected to a proposed marriage due to Gapon's limited employment horizons, however, and as a means of overcoming this obstacle he again sought to become a priest. He made an appeal to Bishop Ilarion [ru] of Poltava, apologizing for past behaviour and promising to fulfill expectations of the church in the future. The bishop was moved by the appeal and interceded with the family, winning the couple permission to marry. Gapon was placed on the fast track to priesthood, occupying a place as a church psalm reader for a year, followed by a pro forma promotion to deacon for just one day before being made priest of the Poltava cemetery church. Gapon's services were innovative and informal and his church rapidly grew in size, negatively affecting other more formalistic local churches, whose priests lodged complaints against him. Nevertheless, Gapon continued to enjoy the support of the bishop in his position and was largely satisfied with his station in life. St. Petersburg Theological Academy, attended by Georgy Gapon, was one of four religious academies of the Russian Orthodox Church. The school was a training facility for theologians. Gapon and his wife had two children in rapid succession, but his wife fell ill following the 1898 birth of the second child, a boy. She died not long afterward and Gapon decided to leave Poltava to make a new life in the capital city of Saint Petersburg. Bishop Ilarion made a strong recommendation to Konstantin Pobedonostsev, procurator of the Holy Synod, that Gapon be allowed to take the entrance examination to the Saint Petersburg Theological Academy despite his lack of the standard Seminary certificate. Gapon placed 16th of 67 applicants and was subsequently awarded a scholarship reserved for the top prospects at the school. He would be one of 235 students to regularly attend classes at the school in 1898. 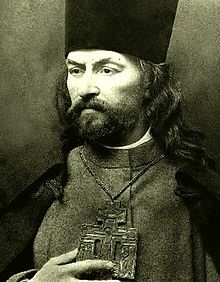 During his first year at the St. Petersburg Academy, Gapon became involved in missionary work for the church through the Society for Religious and Moral Enlightenment in the Spirit of the Orthodox Church. As part of this activity Gapon helped to conduct religious discussions in industrial shops, mess halls, and lodging houses, bringing him into close contact with the urban proletariat for the first time. The tightly-wound Gapon found the strain of missionary work plus the demands of academic life to be too great and fell into a state of acute depression and he began skipping classes. He withdrew from school on a medical leave of absence and spent almost a year in Crimea in an attempt to regain his psychological health. Gapon's status as a student at the St. Petersburg Theological Academy, one of the elite theological training institutions of the Orthodox Church, placed him in good graces with Bishop Nikolai of Taurida, who permitted Gapon to live in a monastery near Sebastopol without having to take monastic vows. In Crimea he met several prominent members of the Tolstoyan movement, all of whom were intensely critical of the Orthodox Church and urged Gapon to leave the priesthood. Gapon rejected this advice, choosing instead to return to course work in St. Petersburg in November 1899, renewed and reinvigorated. Gapon became a religious teacher at the St. Olga children's orphanage in 1900 and became involved in working with factory workers and families impoverished by unemployment. Gapon, with the financial support of Colonel Motojiro Akashi of the Imperial Japanese Army organized the Assembly of Russian Factory and Mill Workers of St. Petersburg, which was also patronized by the Department of the Police and the St. Petersburg Okhrana. The Assembly's objectives were to defend workers' rights and to elevate their moral and religious status. He was the person to lead the industrial workers to the capital of Russia during the year 1905. Only persons of Russian Orthodox faith were eligible to join the ranks. Soon the organization had twelve branches and 8,000 members, and Gapon tried to expand activities to Kiev and Moscow. Gapon was not simply an obedient instrument of the police; cooperating with them, he tried to realize his plan for a positive change of the working class in Russia. From the end of 1904, Gapon started to cooperate with radicals who championed the abolition of the Tsar's autocracy. On 22 January [O.S. 9 January] 1905, the day after a general strike burst out in St. Petersburg, Gapon organized a workers' procession to present an emotionally charged written petition to the Tsar. The demonstration ended tragically (Bloody Sunday 1905). Gapon's life was saved by Pinchas Rutenberg, who took him away from the gunfire and changed his priestly garments to a common man's. He then became the guest of Maxim Gorky. Following Bloody Sunday, Gapon anathematized the Tsar and called upon the workers to take action against the regime, but soon after escaped abroad, where he had close ties with the Socialist-Revolutionary Party. Gapon and Rutenberg were welcomed in Europe both by prominent Russian émigrées Georgy Plekhanov, Vladimir Lenin, Peter Kropotkin and French socialist leaders Jean Jaurès and Georges Clemenceau. He found sanctuary in Geneva and in London at 33 Dunstan House, Stepney, with anarchists Peter Kropotkin and Rudolf Rocker. After the October Manifesto, before the end of 1905, Gapon returned to Russia and resumed contact with the Okhrana. Gapon soon revealed to Rutenberg his contacts with the police and tried to recruit him, too, reasoning that dual loyalties were helpful to the workers' cause. However, Rutenberg reported this provocation to his party leaders, Yevno Azef (who was himself a secret police spy) and Boris Savinkov. On 26 March 1906, Gapon arrived to meet Rutenberg in a rented cottage outside St. Petersburg, and after a month he was found there hanged. Rutenberg asserted later that Gapon was condemned by a comrades' court. In reality, three SR party combatants overheard their conversation from the next room. After Gapon had repeated his collaboration proposal, Rutenberg called the comrades into the room and left. When he returned, Gapon was dead. Gapon died 10 April [O.S. 28 March] 1906. Busch, Noel F. (1969). The Emperor's Sword: Japan vs Russia in the Battle of Tsushima. New York: Funk & Wagnall. Lane, A. Thomas, ed. (1995). "Gapon, Georgii Apollonovich". Biographical Dictionary of European Labor Leaders. 1. Westport, Connecticut: Greenwood Press. pp. 336ff. ISBN 978-0-313-29899-8. Sablinsky, Walter (1976). The Road to Bloody Sunday: Father Gapon and the St. Petersburg Massacre of 1905. Princeton, New Jersey: Princeton University Press. ISBN 978-0-691-10204-7. Yedin, Tova (1999). Maxim Gorky: A Political Biography. Westport, Connecticut: Praeger Publishers. Beach, Chandler B.; McMurry, Frank Morton, eds. (1914). "Gapon, George" . The New Student's Reference Work. Chicago: F. E. Compton and Company. p. 736. Gapon, George (1906). The Story of My Life. New York: E. P. Dutton & Co. Retrieved 12 January 2019. ^ Russian: Гео́ргий Аполло́нович Гапо́н. ^ Lane 1995, p. 336. ^ Sablinsky 1976, p. 34. ^ a b Sablinsky 1976, p. 35. ^ a b c Sablinsky 1976, p. 36. ^ a b c Sablinsky 1976, p. 37. ^ Sablinsky 1976, pp. 37–38. ^ a b c Sablinsky 1976, p. 38. ^ a b Sablinsky 1976, p. 39. ^ Sablinsky 1976, pp. 39–40. ^ a b c d e f Sablinsky 1976, p. 40. ^ Sablinsky 1976, pp. 40–41. ^ Sablinsky 1976, p. 41. ^ Sablinsky 1976, pp. 41–42. ^ a b c d e Sablinsky 1976, p. 42. ^ Sablinsky 1976, p. 45. ^ a b Sablinsky 1976, p. 43. ^ Sablinsky 1976, p. 44. ^ Busch 1969, p. 121. ^ Blunden, Andy (ed.). "Gapon, Georgi Apollonovich (1870–1906)". Encyclopedia of Marxism. Marxists Internet Archive. Retrieved 12 January 2019. ^ Yedin 1999, p. 49. ^ "George Gapon". Spartacus Educational. Archived from the original on 13 February 2007. Retrieved 21 February 2007. ^ Evans, Charles T. "Father Gapon". novaonline.nvcc.edu. Wikimedia Commons has media related to George Gapon. "Gapon, George" . The New Student's Reference Work . 1914. This page was last edited on 11 April 2019, at 19:14 (UTC).